These chewy salted caramels are an easy, homemade holiday gift for family, friends, neighbors, teachers, and most importantly, yourself. They’re soft and chewy, creamy and sweet, with a healthy dusting of flaky sea salt for the perfect sweet-savory bite. I’ve been making these treats for years, and friends near and far start clamoring for them as soon as December 1st hits. 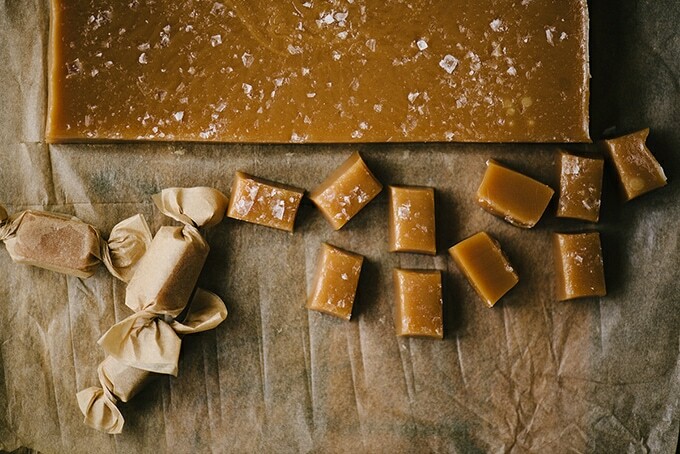 It’s the most wonderful time of the year – caramel candy time! 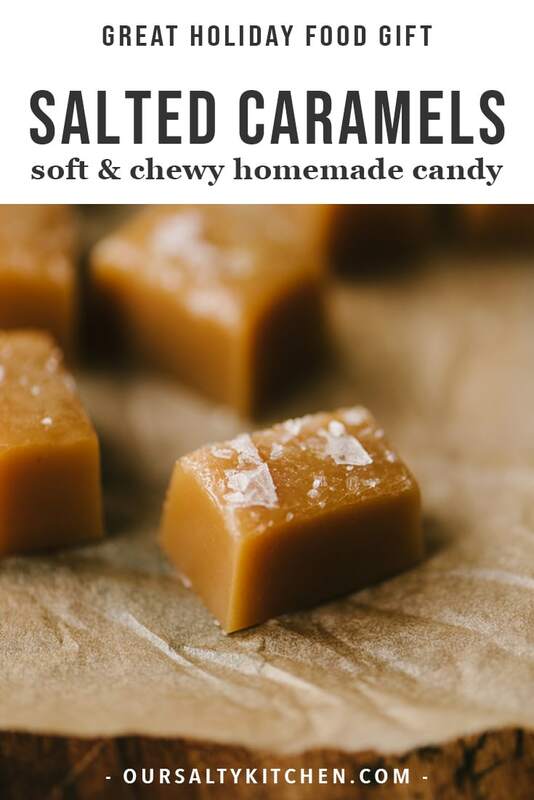 I’ve been making this recipe for soft and chewy salted caramels for years and years. It’s the first Christmas candy I ever made, and the first Christmas tradition I established for myself as an adult. In the beginning it was a cheap way to gift something lovely to friends and coworkers in my super broke 20’s, but nowadays it’s plain ol’ tradition. Plus I’d have mutiny on my hands if I skipped a year. Last year I made around 40 dozen. This year I think it’ll be closer to 60. I know. But really, they’re that good. Luckily these salted caramels are pretty foolproof. The hardest part is a tossup between cutting up all those tiny parchment squares for wrapping, and not eating so many that I have to make yet another batch to supplement the stash. I have a big bowl of them by the front door for guests to nibble on, I save another stash for Christmas Eve and Christmas Day, and the rest I tuck into gift boxes to share with friends, family, neighbors, and teachers. And then there’s the secret stash for myself – baker’s treat! 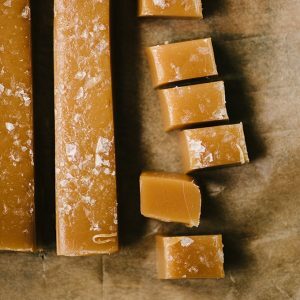 There are a lot of recipes for soft, chewy salted caramels out there, and most of them are done with a two-step process. As has been repeatedly established on this blog, I generally like to take the easy way out. The less fuss, the better. I’m not knocking on the recipes that do it up proper. I’m just lazy. Which is why I love this recipe so much – you basically just dump all of the ingredients into a pot, melt ’em until smooth, and then cook and cook and cook until the caramel reaches 250-ish degrees. Let’s get started! 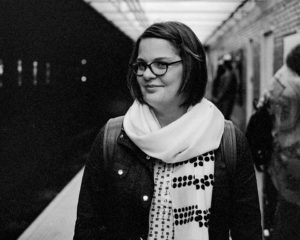 You’ll need a large, heavy bottomed pot (I like using my 6-quart enameled dutch oven), candy thermometer, rubber spatula, a 8″ x 8″ baking dish, and some parchment paper. Cooking spray is also useful, but a little extra butter for greasing the parchment paper totally gets the job done. 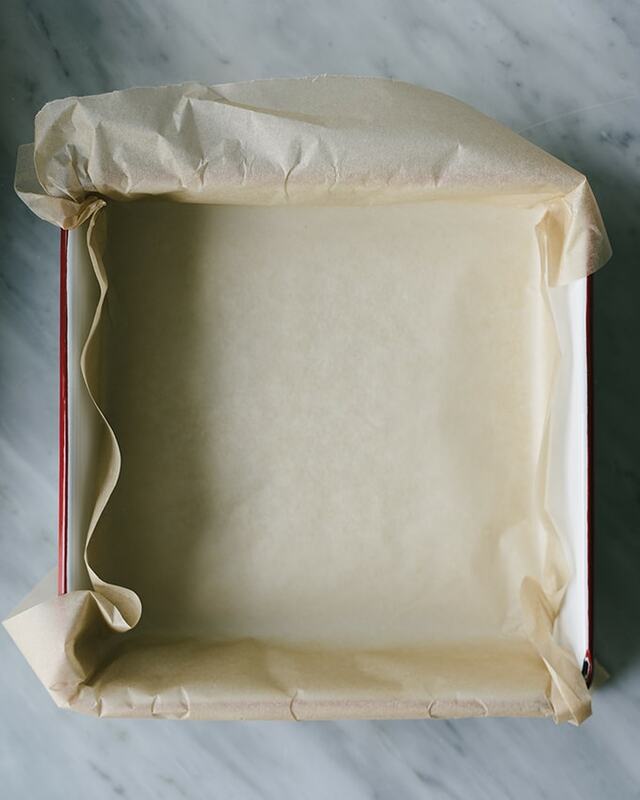 Line your baking dish with parchment paper, grease it with butter (or lightly coat with cooking spray), and set aside. 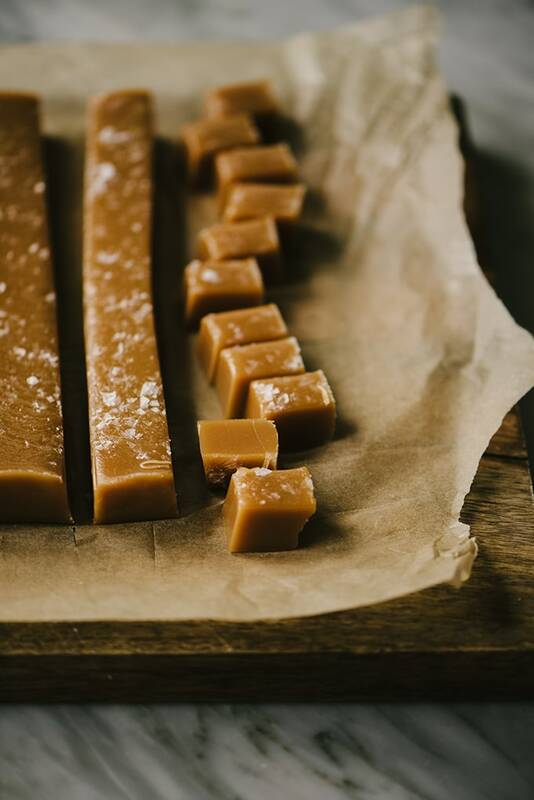 Do it first and get it out of the way – once those caramels reach the right temperature, you need to get them into the baking dish stat, and you don’t want to be fussing with your parchment at the last minute. Grab your pot, set it on the stove and add the white sugar, brown sugar, corn syrup, heavy cream, and butter. Cube the butter so it melts evenly. Heat over high heat until all of the ingredients have melted and the mixture is smooth. Keep heating over high heat until the caramel mixture boils. Then reduce the heat and affix a candy thermometer to the side of the pot. From here, it’s just a matter of time. 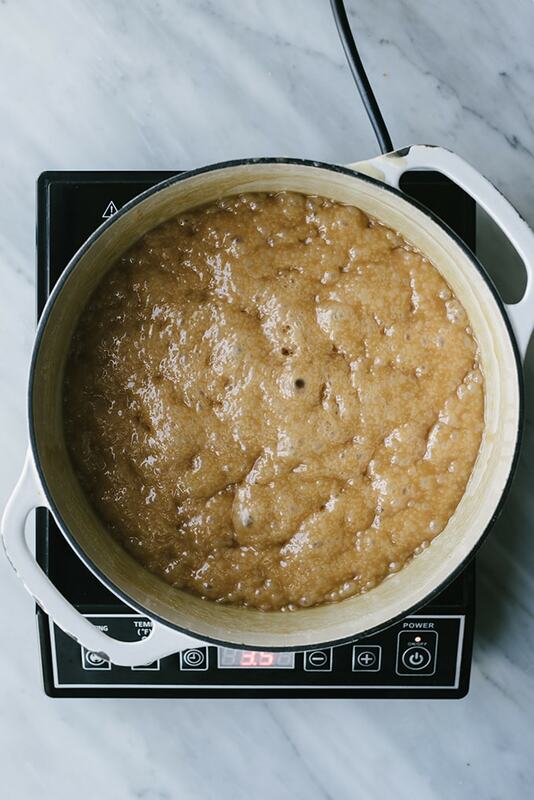 You want to simmer the caramels to just beyond the “soft ball” stage – I aim for a temperature between 248-252. Any lower, and they’ll be too soft, and any higher and they’ll be too hard. Right in that range is the soft, chewy sweet spot. The caramel will get darker and darker as it simmers. It’ll expand at first, and you’ll get a layer of foamy bubbles on top. This is all good. As the caramels continue to cook, the bubbles will get smaller and more dense, and the mixture will become thicker and goopier. Use your spatula or a wooden spoon to occasionally reincorporate any sugar crystals from the sides of the pan back into the caramel. Once it hits the right temperature, remove from heat, stir in the vanilla (it will vigorously bubble at the alcohol cooks off), and then pour into the prepared baking sheet. Exhibit EXTREME CAUTION when pouring the caramels into the pan – 250* candy is super freaking hot, and it will seriously hurt if you get some on your skin. I wear oven mitts to protect my hands and suggest you do the same. Allow the caramels to cool for 15-20 minutes at room temperature, then dust with flaky salt. I use maldon sea salt and it’s divine. At this point, you can either transfer the caramels to the fridge to firm up, or let them cool completely at room temperature. I do the room temp option, because it basically becomes a salted caramel scented candle as it cools. So good. Once they’ve cooled, dust the top with a little more salt. To cut the caramels, pull up on the sides of the parchment paper to release the entire block from the pan and place it on a cutting board. 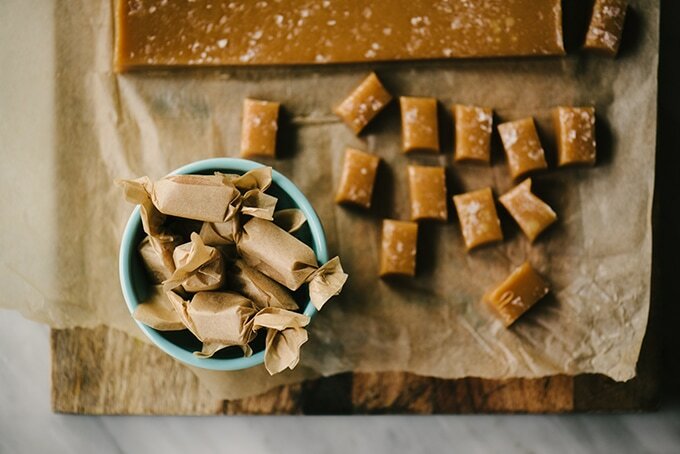 Using a sharp knife that you’ve greased with either butter or cooking spray, slice the block into one-inch wide strips, then slice those into two-thirds of an inch rectangles (this will give you a dozen caramels per row), and wrap in parchment squares (I cut 4″ x 5″ squares). I gift these in 1-lb candy boxes, and can generally fit about a dozen and a half candies into a box. These keep for a couple of weeks at room temperature if you don’t eat them within the first 2 days. Finally, a weird note about doubling the recipe. This recipe easily doubles, however, you should reduce the butter by 2 tbsp. If you don’t, you’ll end up with some extra butter that, for whatever reason, doesn’t incorporate into the caramels and your cooled caramels will be a bit greasy. 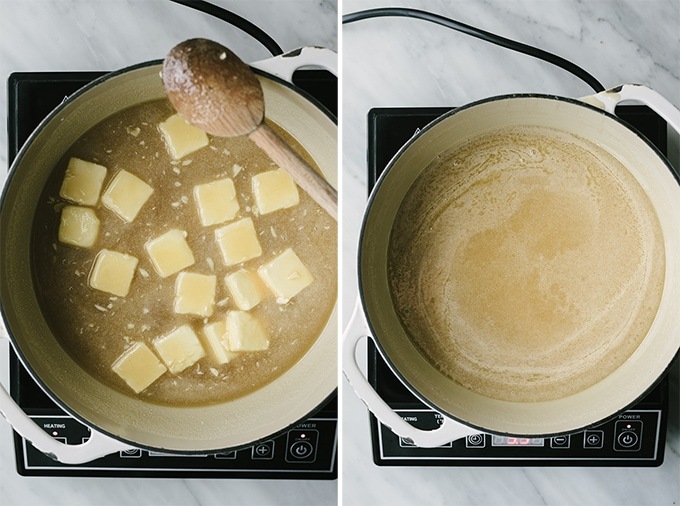 It’s easy enough to fix by taking away a few tablespoons of butter in the beginning. 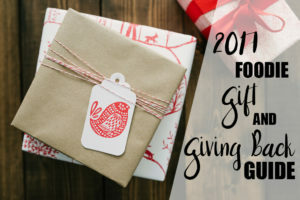 2017 FOODIE GIFT AND GIVING BACK GUIDE! Still shopping for the holidays? Take a look through my comprehensive gift guide. Find the perfect gift for the food lover in your life, as well as some terrific organizations for feel good foodie donations. These chewy salted caramels are an easy, homemade holiday gift for family, friends, neighbors, teachers, and most importantly, yourself. They're soft and chewy, creamy and sweet, with a healthy dusting of flaky sea salt for the perfect sweet-savory bite. Line your baking dish with parchment paper, leaving enough hanging over two opposite sides to easily lift the cooled caramels out of the pan. Liberally grease the parchment with butter or cooking spray. Combine the white sugar, brown sugar, corn syrup,heavy cream and butter in a 6-quart dutch oven or other heavy bottomed pot. Heat over medium heat and stir continuously until all ingredients are melted and blended together. Affix a candy thermometer to the side of the pot, about 1" below the surface of the mixture, but not touching the bottom. Turn up the heat to high and bring the sugar mixture to a boil. 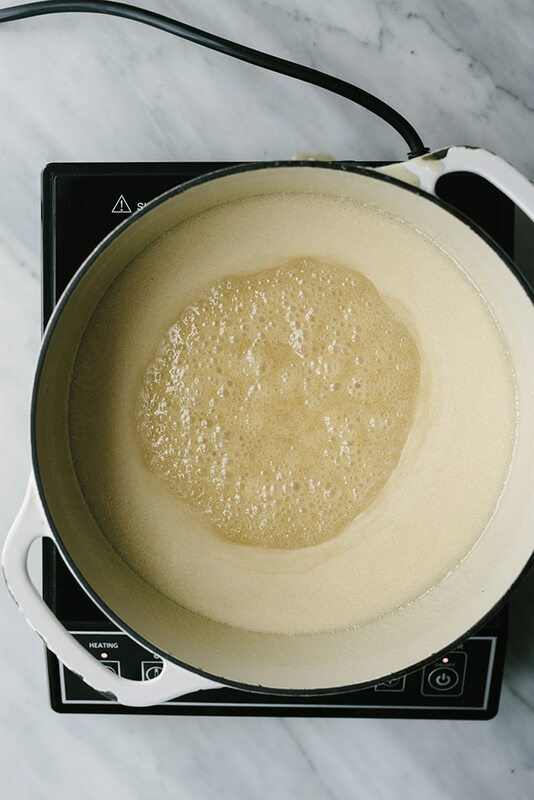 Once boiling, reduce the heat to medium low and let the sugar mixture simmer with slow, medium-sized bubbles until the candy thermometer reaches 248-252*. You can stir every once in a while to incorporate the sugar crystals from the side of the pan back into the mixture. It will take 40-45 minutes to reach the correct temperature. Watch the thermometer carefully after it reaches 230-235*, as the temperature increases pretty quickly after that point. Once the mixture hits 248-252*, immediately remove from heat and pour in the vanilla. The mixture will vigorously bubble. Stir in the vanilla until evenly incorporated, then pour the caramel into the prepared baking dish. Use oven mitts to protect your hands and wrists from any splatter (it's extremely hot!). 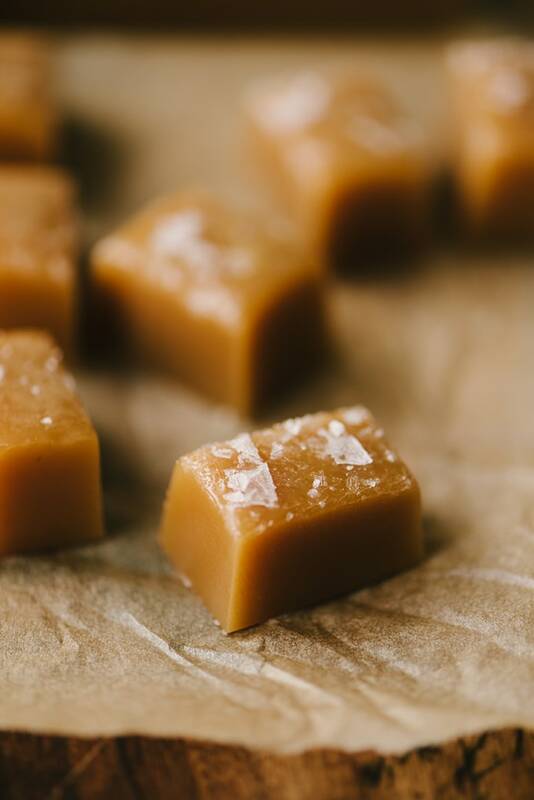 Allow the caramel to cool at room temperature for 15-20 minutes and then sprinkle half the sea salt over the caramels. Allow the caramels to cool at room temperature overnight. The next day, sprinkle the remaining salt over the caramels. 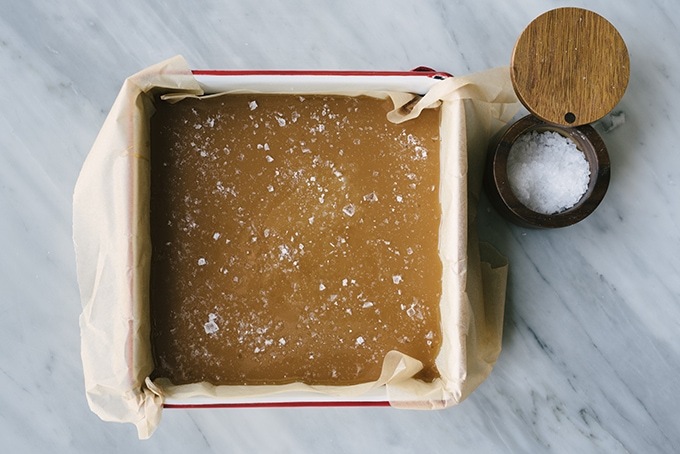 Lift up the caramels by the parchment paper flaps and transfer to a cutting board. 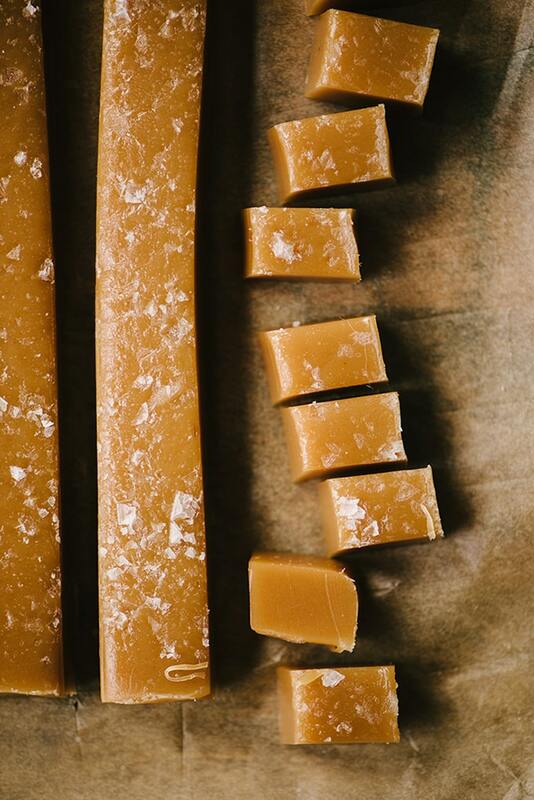 Cut the caramels into 1" x 2/3" rectangles with a sharp, non-serrated blade. I occasionally spritz the blade with cooking spray (does not affect the taste) to ease the cutting process. 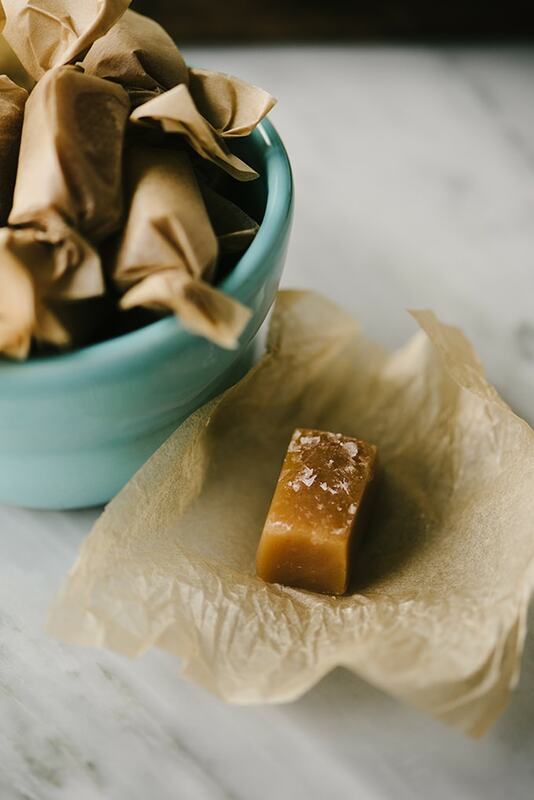 Wrap the caramels in 4" x 5" squares of wax paper. The caramels are good for 2-3 weeks if stored in an airtight container. I gift these in 1-lb gift boxes in 1.5 dozen increments. Calories represent two salted caramels. Cooking time doesn't reflect at least 2 hours for cooling time in the fridge, or up to overnight at room temperature. 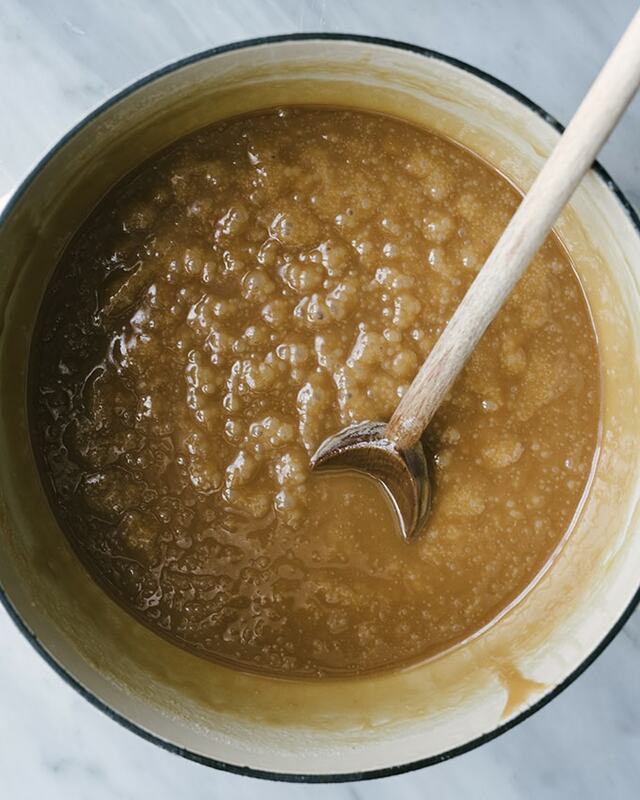 When doubling this recipe, reduce the butter by 2 tbsp to prevent the final caramels from being too greasy. The caramel method seems pretty easy! I like that about it as caramel can seem a bit intimidating. Loving the brown paper wrappers too. You’re right, it would definitely be hard for me to not eat too many as I was wrapping them up. I love salted caramels but they’ve always been too intimidating to make at home. Thank you for making it look actually achievable. 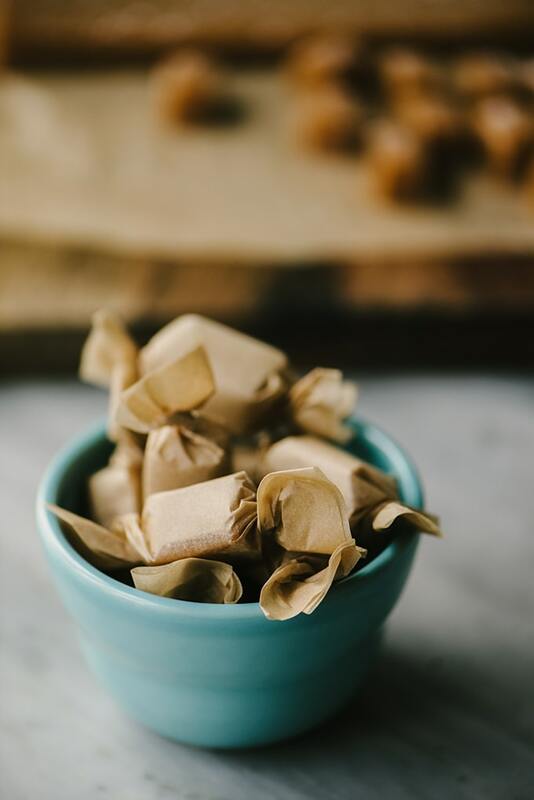 We have a friend of the family who always gifts homemade caramels just like these, and they are definitely one of the highlights of the season. I can’t wait to try your recipe so I can enjoy them all year round! Wow these are gorgeous! Would never have guessed they were homemade. They just look so perfect, yum! For a salted-caramel-aholic, this recipe is pure heaven. The only thing that could be better is receiving a dozen as a gift! These were the best caramels I’ve ever made and a big hit with those I’ve been gifting them to. I’ve tried making caramels following other recipes and they were greasy or too hard. These were fantastic and less challenging than other methods I’ve tried. These are DELICIOUS!!!! The best part is they don’t stick to the paper that you wrap them OR your teeth!!! With just the perfect amount of salt on top they melt in your mouth. Wonderful to give as gifts or have out at a party! I love the direction to dump everything together from the get-go: sugar, syrup, cream and butter. This is much more convenient. Another topping I’ve used is cracked pink peppercorns. YUM!